The $400 Dash Express is the first car navigation device in the U.S. that can send data back to a server rather than just passively receiving it. Although this enables the company to track the location of each device, Dash does not give owners a way to use this same data to find their units if they get stolen. It's a cruel irony: Car navigation devices keep you from getting lost, but their location-sensing acumen won't help you find them if they get lost or stolen. Why not? Because location and tracking are two different matters. "The GPS calculates location for you. Communicating that location to a tracking center requires a separate service," says Kanwar Chadha, founder and vice president of SiRF Technology, the largest supplier of GPS chips to navigation device makers. Of course, GPS tracking systems have existed for years  they are used every day to keep tabs on valuable cargo, rental cars, and even parolees who are shackled to GPS-enabled ankle bracelets. Cell phones are routinely embedded with GPS chips too, and can communicate their location via cellular networks. (The Helio Ocean phone, for example, has a "Buddy Beacon" feature that lets you map your friends' precise whereabouts on your handset.) Personal navigation units could easily incorporate the same features, but device makers say there's little demand. "Most consumers are just looking to get from Point A to Point B," notes Tom Murray, vice president of TomTom. That may be about to change. 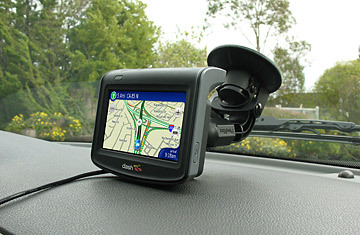 Some 5.8 million personal navigation devices were sold in the U.S. in 2007, according to NPD Group, and their theft is on the rise. Like iPods and laptop computers before them, the pricey gadgets have become the newest high-tech target. Yet even as sales have slowed in recent months as consumers cut back on discretionary spending, theft of the devices has continued to soar. According to the FBI, as of late April, 31,324 portable navigation devices had been reported stolen in the U.S.  a 12% increase since late February. The crime is particularly rampant in big cities  Houston saw such robberies triple last year to 1,303. "These thefts get reported every day," says Captain Don McKinney of the Houston Police Department. Leslie Presutti, director of product management at Qualcomm, which sells the GPS chips that go into more than 100 million cell phones each year, says enabling two-way connectivity on GPS devices is the logical next step. As for why device makers don't offer it yet, even though the technology has long existed to do so, she says, "They never really had to compete in this space, so there wasn't the need." But as prices come down (on April 23, TomTom reported that its average product price had fallen 42% over the past year to $185 per unit) and as the number of GPS device manufacturers increases, companies are scrambling for ways to differentiate their wares. Even with two-way connectivity, makers may still allow consumers to opt out of subscribing to the unit-tracking function, in part because that service would increase the annual fee  about $50  that many companies already charge to transmit traffic updates and other information. What's more, it's not the average consumer who would track down a criminal to get his TomTom or Mio back. But the fact that it could be tracked at all would serve as a powerful deterrent; it would also help authorities locate and bust larger-scale crime rings, which typically hawk stolen electronics in pawn shops, on street corners, and on websites like Craigslist and eBay. What's more, it would help authorities locate people in roadside emergencies or if they're reported missing, much like GM's OnStar service. "Two-way connectivity is definitely on our roadmap," says Larry Rougas, vice president of marketing and product planning for Pioneer, which specializes in high-end navigation devices with large screens. Until then, you're on your own when it comes to keeping your GPS from ending up in the wrong hands.